The New York Times Sunday Magazine has a stunning beautiful story in this Sunday's "Love City" issue (online early). 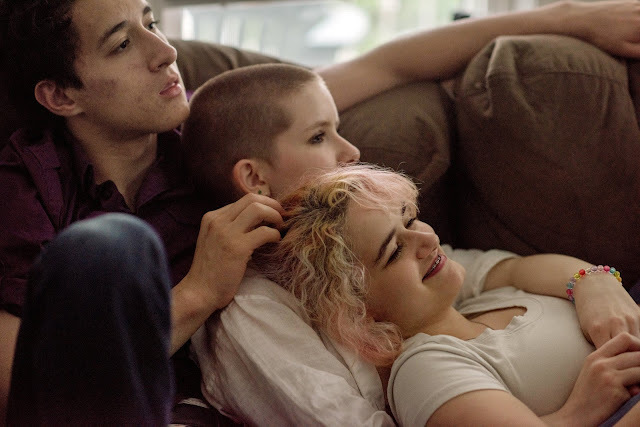 It's about three Brooklyn high school students in love, and the happily genderfluid youth world they are embedded within. Hanna (right) with her boyfriend, Harry, and her girlfriend, Beaux, at Hanna’s house in Brooklyn. ...Over lunch at a big round table in the temple basement, Beaux looked at Hanna and said to the world, but mostly to Harry, “She’s so pretty!” Harry and Beaux shared a moment of mutual appreciation over Hanna’s adorable nose freckles. Now, at the end of 11th grade, the three teenagers moved with a flowing intimacy — their bodies melting, looping and reconfiguring like the liquid in a lava lamp. A 10-year-old girl, watching them, became so mesmerized that she inserted herself in the middle, on Beaux’s lap. 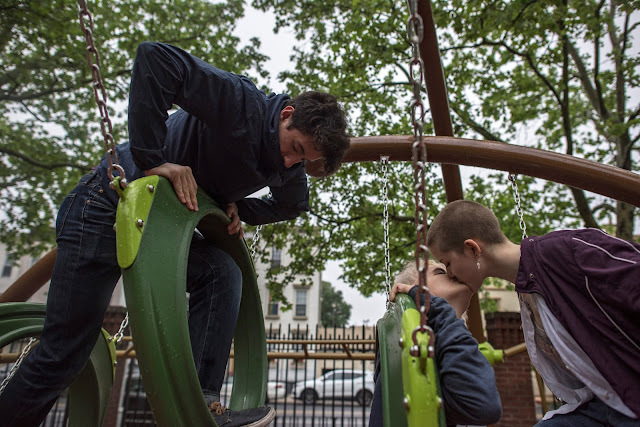 Beaux (right), Hanna and Harry at a playground in Brooklyn. On the rainy walk back up Church Avenue to Hanna’s house, Hanna, Beaux and Harry cycled through those seemingly profound topics that teenagers have been discussing forever.... Hanna floated between Beaux and Harry. She’s the quietest of the bunch, and her heart seems almost miraculously whole and unbroken, like a cake hot from the oven before the surface cools, contracts and cracks. This is perhaps a result of the fact that Hanna is a person who falls in love with one thing and then falls in love with another thing and then, instead of letting go of the first, just adds on. She loved all the Harry Potter books, and then she loved all the Percy Jackson books, and she still rereads them both. ... And so it was with Harry and Beaux. ...Harry [had] handled Beaux’s request extremely well. He was a mensch already and had been friends with Hanna in ninth grade, when she talked about almost nothing but her love for Beaux. He did not want to be the kind of boyfriend who kept his girlfriend from chasing her bliss. Go read the whole thing (online June 7, 2018), then share it.